It was not yet the middle of the week when I felt the first pangs of a meltdown or serious burnout in the works. I planned to take a break in the middle of the week, head out for the day, a few errands, a day in the sun, away from emails and phone calls, and all the flotsam and jetsam bobbing in the murky waters surrounding me. It was early Wednesday when my intuition coaxed my fingers into dialing a friend’s number and postponing our appointment that morning. I had no good reason at the moment, but I simply sensed that I had to clear the deck that day. My bag was packed, I’d nearly left when my intuition again urged me to open my email, just to scan what had landed in my inbox during my absence. Among the two dozen or so unread messages, I spotted an email from one of my oldest friends. My friendship with RT goes back to our first year of high school. Though RT’s lived (and raised kids) in the US for eons and we’re infrequently in touch, we nevertheless make a point of touching base for each others’ birthdays. Which is why I wasn’t surprised to see an email from her. I opened it only to check if she might be in town visiting her partner. It took me a few moments to register the meaning of RT’s message. 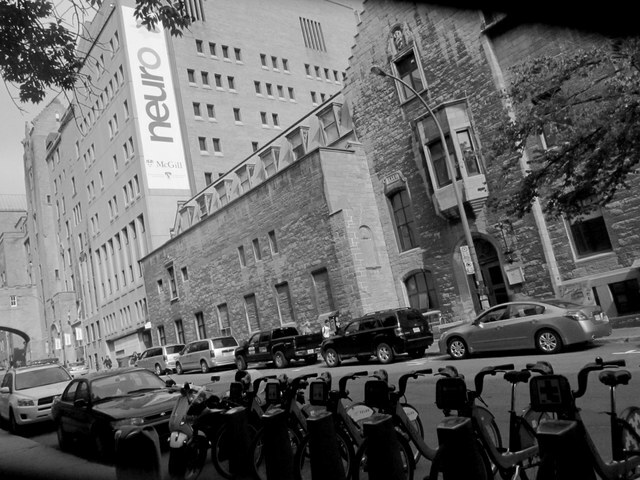 She was indeed in town, but writing from a hospital bed, after suffering a subarachnoid brain hemorrhage two days earlier… that nearly killed her. My mind went b lank. Then it went into a tailspin. I called the hospital, confirmed that she was in ICU, grabbed a precious stone (recently gifted to me by a healer) and asked for a lift to the hospital. The next couple of hours are still somewhat of a blur; she was upright, walking the corridor, being asked to balance herself with eyes closed. We hadn’t seen each other in years. Now we were reuniting in a hospital room. Comparing notes. I was wrapping her up in a blanket, helped her into bed, then gave her an old black & white high school photo I’d stumbled upon a few days earlier. By the time I hugged her gently and left the ward, I knew exactly what was in order: a big dose of fresh air, trees and grass… I was craving nature. It was a sunny day. I headed straight to one of my favorite parks, in a neighborhood that boasts some of the quaintest cafes, boutiques and vibes in the city (at least in my humble opinion). A group of teenagers were kicking a soccer ball around nearby, while mothers strolled with infants and an elderly couple sat on a bench, each one covered with a large sunhat, their eyes trained on their respective e-readers. I unfolded a blanket, spread magazines, papers, markers and scissors around and lay down on my back squinting upwards, shifting my gaze to avoid the sun’s direct glare. Squirrels leaped between branches, creating bushy wisps of silhouettes brushing against the sky. Lucky to be alive. RT had heard the same words from the mouths of doctors as I once had. I wondered if it would sink into every cell of her body as it had mine; if it would continue to echo in her ears for years after this incident, perhaps for the rest of the her life. Would RT ever come to believe in her guardian angels – as I had in mine? Before slipping into a tearful state, I flipped onto my stomach, intending to write and cut and draw and squeeze out as much creative juice from my addled brain as I possibly could. But as I was flipping through the National Geographic magazine, something bright caught my attention out of the corner of my eye. 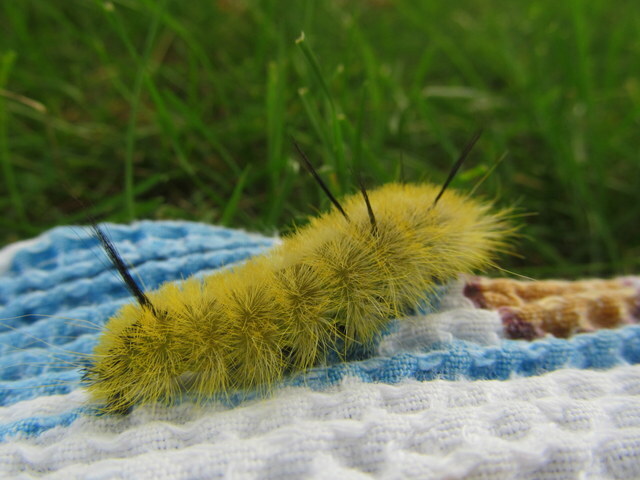 It was a fuzzy yellow caterpillar, a few black stripes and spikes protruding from its spine – the likes of which I’d never laid eyes on before. 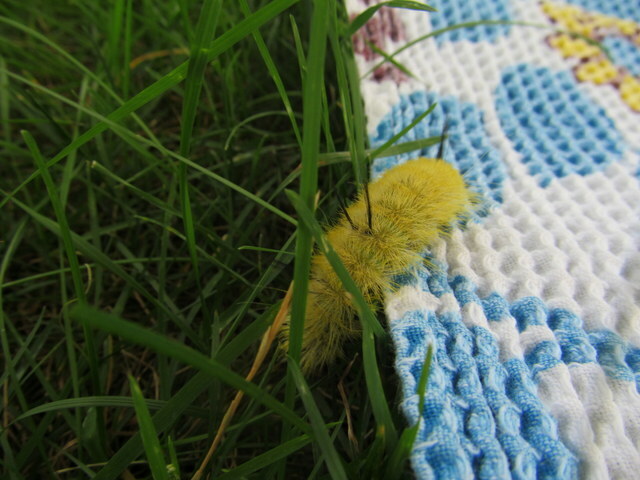 It was maneuvering itself from the grass onto the blanket, then proceeded to slink towards me. I waited and watched. Watched and waited. Sensing that it likely would prefer to be back on home ground (i.e. grass), I nudged it onto a thin branch and (ok, unin tentionally but perhaps a little too quickly) unleashed it a few feet away. It curled up immediately, and I observed in angst until it began to unfurl itself again. I returned once again to the magazine. But there he (she?) was again, clambering up onto the blanket, heading towards me. I moved aside slowly, imagining that it simply wanted to cross the blanket to get to the other side. But it grounded to a halt as soon as I inched over. I stood up and the little creature swerved in my direction, as if it were intentionally seeking me out. I scooped the caterpillar onto a leaf and placed it a few feet away in another direction. Still it came back, shuffling up the sid es of my sandals, weaving through the straps and over the buckles, then sliding back down into the grass. Thus it continued for the rest of the afternoon.He wiggled his way over magazines, paper, scissors – all unfamiliar territory. But he kept coming back for more. 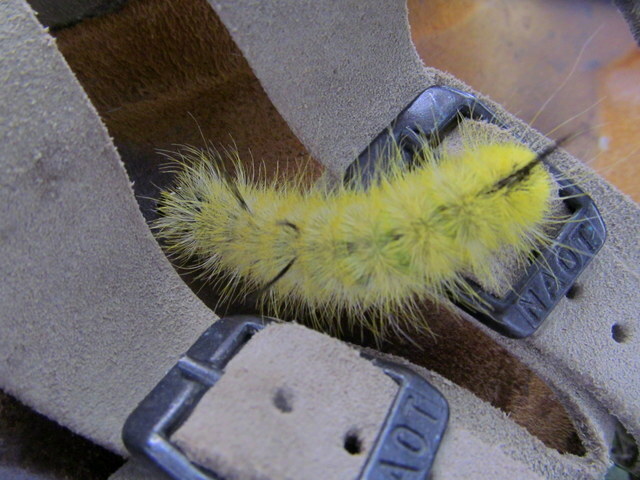 I danced with that caterpillar, or should I say that he tried desperately to dance with me. I’d invited him into my space, or should I say that he invited me into his world, of grass, sticks and stones… and there I was brushing him off. What a very reticent dance partner I was.. when he merely wanted to sniff around, enjoy the new textures and waltz! 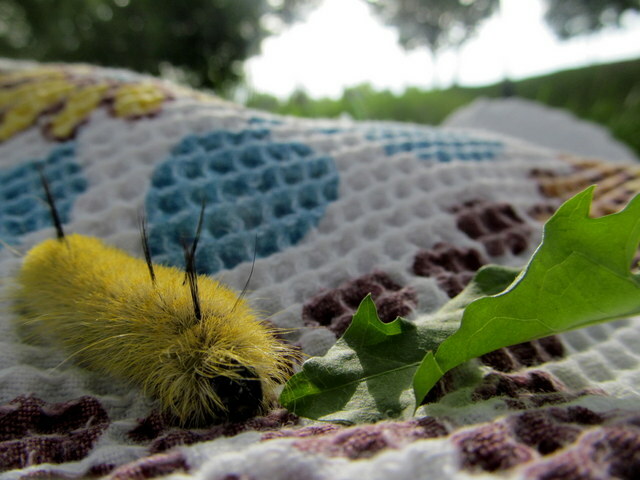 The yellow caterpillar eventually gave up on me and found a dried leaf nearby where he found refuge – or tasty bugs. There was a subtle meaning to this whole waltzing episode and it wasn’t lost on me. 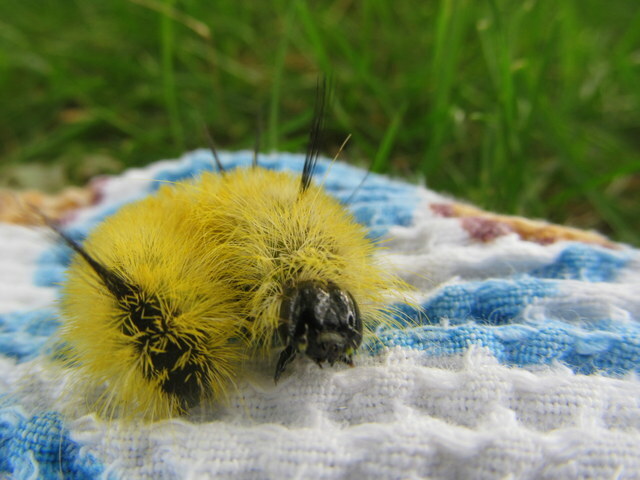 Like dogs and other creatures of the animal world are known to do (and I’ve been at the receiving end countless times), this fuzzy yellow caterpillar was there to keep watch over me. He wasn’t going to let me out of his sight. Dancing with a caterpillar, what fun. A little angel in your midst. Sorry about your friend, that’s always hard. Glad to see all is well with you. Love your writings. Well, I was more of a reluctant dance partner, but I hope I remember next time.. to join in! Maybe a tango 😉 Thnx, your writing and photos are informative and inspirational too! Rude can also mean ‘vigorous or hearty’ 😉 I guess it hasn’t yet made its way into North American English – Amit you can be the first to try it out! In my life I’ve come to recognize the far superior extra sensory perceptions of the animal kingdom. What vibrations we must emit when we’re hurting or overwhelmed by emotion! Countless times I’ve been visited by birds, or butterflies, geckos and once, a persistent squirrel that hang out for hours for no other reason than to be a companion when I most urgently need one. 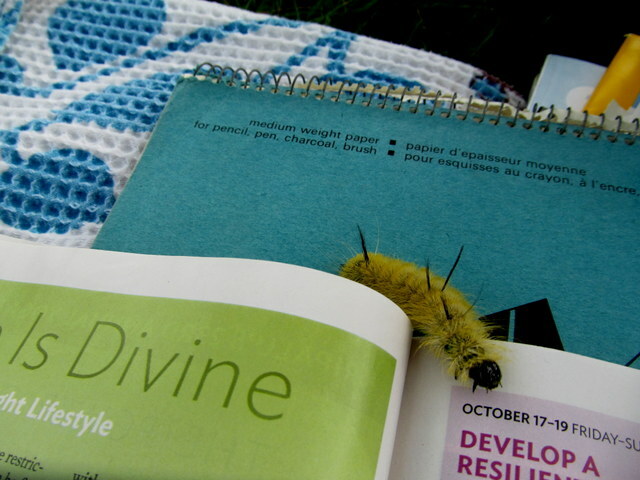 I have no doubt that the caterpillar was there to lend support, provide distraction, and take you outside of yourself into wonder and amazement. When I remember that we’re all connected, every living thing is part of this immense cosmos, it humbles me. Sometimes I think that perhaps humans may be the lesser evolved creatures.